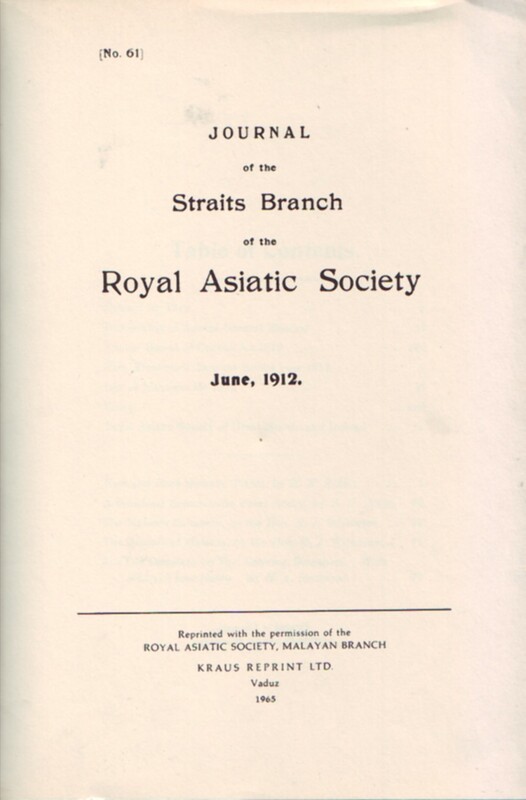 Malaysian Branch of the Royal Asiatic Society. Our Esteemed Patrons, Duli Yang Maha Mulia Sultan Sharafuddin Idris Shah, Ibni Almarhum Sultan Salahuddin Abdul Aziz Shah Alhaj, Sultan Selangor. Duli Yang Teramat Mulia Paduka Seri Pengiran Perdana, Wazir Sahibul Himmah Wal-Waqar Pengiran Muda Mohamed Bolkiah. Lee Kuan Yew Esq. The rise and fall of nations is a favourite subject among early historians and are featured prominently in older issues of the JSBRAS and the JMBRAS. Political change by due process itself is largely unremarkable but throughout history, such changes have not always been effected through peaceful means and many a mighty nation have been decimated by great upheavals, revolution and conquest. In recent times, such changes have not always been satisfactorily managed, leading up to civil war and protracted conflict, and eventually to the emergence of failed states. Iraq, Afghanistan and Somalia are among the more notable contemporary examples. Wilkinson's article charts the rise and fall of a trading nation which once controlled the vital sea lane of the Straits of Malacca but brought down by complacency, indolence, intrigue and colonial expansion. The following are some of the pertinent points highlighted by the article. Wilkinson’s articles on the Malacca Sultanate were the first attempt by a scholar-administrator in British Malaya to compile and merge the assorted fact and fiction surrounding the sultanate into a coherent, modern narrative. Though written in a florid Victorian style which has entirely disappeared from the pages of the JMBRAS, it is still highly readable today and perhaps for this reason, retains a degree of elusive charm to enthusiasts of that prose style. The articles highlighted here originally appeared in the August and November 1911 issues of the Singapore Diocesan Magazine. They were written in Wilkinson’s characteristically lively and amiable style, remarkably devoid of academic pretension and jargon. In the first featured article, Wilkinson briefly described the historical origins of the Malacca Sultanate and charted its rise and decline, ending with an unflattering description of the city-state on the eve of Portuguese arrival in August 1509, a turning point in the history of the sultanate. The second article, obviously a continuation of the first, focuses almost exclusively on events that followed the arrival of Diego Lopez de Sequiera and which led to the capitulation of the city state in July 1511. The Malacca Sultanate must have presented a source of fascination for scholar-administrators such as Wilkinson, Sir William Maxwell and Sir Richard Winstedt all of whom had their papers on aspects of Malacca history published in the JMBRAS. Wilkinson himself was to return to the subject some 20-odd years later with a longer paper on the sultanate that appeared in the October 1935 issue of the JMBRAS. Wilkinson described the origins of Malacca as a petty village populated by aboriginal inhabitants which attracted the refugees of kingdoms ravaged by the onslaught of the Majapahit Empire throughout Southeast Asia, including Palembang, Singapore, Langkasuka and Pasai. Wilkinson did not give a specific date for its establishment but noted that what was an insignificant settlement in 1370 had, by the early 1400s, emerged as a cosmopolitan port enjoying regional influence. Wilkinson’s article favoured the conventional narrative regarding the early history of the sultanate. According to him, the local ruler who was a Hindu was called paramisura but had converted to Islam, styling himself Sultan Muhammad Shah. Described as pragmatic and intelligent, the newly minted ruler had been all too aware of the changing geopolitical realities of the region and had sought patronage from China. Wilkinson acknowledged that Malacca experienced several distinct phases in its six centuries of existence. The first Malacca was a fishing village but this then gave way to its second existence, namely as an imperial city that ruled over Pahang, Kampar, Siak and Indragiri during its apex, which Wilkinson identified as the reign of Sultan Mansur Shah (1445-1470). The glowing description of Malacca gave way gradually to a subtly sinister tone Wilkinson adopted in describing the city state circa 1460. Malacca was experiencing rapid urbanisation and its population was now highly diverse, the foreigners being painted as opportunists. The government of the day too was said to be corrupt and severe, being deeply rooted in a feudal hierarchy which engendered a debilitating system of patronage among the populace. Wilkinson felt that the imminent downfall of Malacca was presaged by the moral decay that was apparent everywhere in the kingdom, namely among the ruling elite. In keeping with an egalitarian streak in his character, it was typical of Wilkinson to adopt this line. For a time, Wilkinson acted as Schools Inspector for the Straits Settlements but his ideas of educational reform put him at odds with his superiors. In fact, Wilkinson was the driving force behind the establishment of the Malay College of Kuala Kangsar and felt that its establishment would remedy the colonial policy of neglect towards the Malays. Indeed Wilkinson was said to have been deeply disappointed when the Malay College ended up being an educational establishment for the Malay elite rather than one that was open to all Malays. Wilkinson admired enterprise, high character and moral righteousness, traits that were highly valued by Victorian society. He noted, perhaps with some despair, that the Malays had an odd notion of blind and unquestioning loyalty to the king, and that whatever unpalatable deed was executed was considered an act of valour if done to advance royal interest. Noting that the first few Malaccan monarchs were self-made and intelligent statesmen, Wilkinson deplored the state in which the sultanate had found itself on the eve of Portuguese arrival. Wilkinson was particularly damning in his judgement of the later sultans, describing them as capricious and jaded tyrants. Sultan Mahmud Shah especially was spared no vitriol, Wilkinson calling him a good-for-nothing tyrant who was more interested in destroying rather than fortifying what his ancestors had made of Malacca. Wilkinson had been thoroughly acquainted with the Malay character by the time he wrote these pieces and it may be said that he sought to underline several unpalatable aspects of Malay character, namely complacency and indolence. However, Wilkinson was full of praise for the few competent officials on whom lay the onerous burden of governing the port-city in a rapidly changing geopolitical environment, talented men such as Bendahara Tun Mutahir, his son Tun Hasan and Hang Nadim, the laksamana. Arguably, Wilkinson saw in these types the future Malay administrators who would function in the same mould as the early sultans of Malacca and possess similar drive and enterprise to succeed. Conclusion: Wilkinson’s article described a powerful Malay polity on the brink of decline, and outlined some of the factors that led to its downfall after a brief period of existence of about a century. It identified some of the weaknesses of a socio-political system that thrived on feudalism and patronage to the extent of breeding complacency, indolence, corruption and political intrigue. Read in current times, Wilkinson’s century-old article resonates very deeply and offers some useful insights on governance for future generations. Richard James Wilkinson was born on 29 May 1867 to parents Richard and Jane Wilkinson. His father had been the British consul in Malaga and Salonika, where the younger Wilkinson was born. He was educated at Felsted School in Essex before going up to Trinity College, Cambridge. Wilkinson distinguished himself academically, winning five prizes, but he did not collect his B.A. until 1901. After failing to get into the Indian Civil Service, Wilkinson instead found himself drawn into the Malayan Civil Service in 1889. However he was unhappy over his assignments and sought a transfer to China. Sir William Maxwell, the Governor of the Straits Settlements, however spotted in Wilkinson a talented administrator and promptly made him secretary of the Straits Branch of the Royal Asiatic Society to keep him engaged. Wilkinson became Superintendent of Education in Penang in 1895 and as acting Schools Inspector for the Straits Settlements, impressed the Colonial Office with his annual report on Malayan education in 1899. Wilkinson was also responsible for establishing the first Malay teacher’s training college at Durian Daun in Malacca. In 1903, he became Schools Inspector of the Federated Malay States. After a short tenure in Negri Sembilan as its Resident (1910-1911), Wilkinson became Colonial Secretary of the Straits Settlements. His administrative abilities came to the fore when he acted as governor twice, in 1911 and in 1914, on both occasions acquitting himself admirably. In 1916, Wilkinson accepted a promotion to become Governor of Sierra Leone, a decision which he regretted since it meant having to leave Malaya. By 1922, Wilkinson had retired to Myteline in Lesbos but was forced to evacuate to Izmir (Smyrna) when Germany invaded Greece. Wilkinson died on 5 December 1941 in Izmir. Wilkinson’s scholarship and expertise on Malay subjects made him one of the leading authorities on Malays in his lifetime. His Malay-English Dictionary, published in two volumes in 1901 and 1902 quickly became the definitive work on the subject, and was so comprehensive that it remains in use even today. Wilkinson was also remembered for his series of Papers on Malay Subjects, which he skilfully edited for the first series and which established itself as a quintessential work to be studied by fresh cadets in the Malayan Civil Service. John Gullick’s incomparable biographical article on Wilkinson can be found in JMBRAS, Vol. 74(1), June 2001 and is compulsory reading for anybody wishing to understand the life of this extraordinary man.